Sunsama is a cloud-based team calendar for planning, running, and documenting meetings, and sharing agendas, minutes and action items with participants. To help users run, document, and follow-up their meetings more effectively, Sunsama upgrades every single event on the calendar to include an agenda, notes, action items and comments. The app also includes advanced tagging and search features to easily find events, notes and action items. Sunsama is fully synchronized with Google Calendar and integrates with other daily tools like Slack for synchronous communications. Calendars, Tasks, and Meeting trackers all in one, with Slack integration. Before Sunsama I was regularly using Google Calendars, MeisterTask, and Do.com at the office. Since our team introduced Sunsama into the toolset, I have 2 fewer tabs open on my browser at any given time, and 3 fewer tools to deal with in my day-to-day, and that's awesome. Let's get down to the features. Sunsama's calendar feature is pretty cool, ( I have my Google Calendar hooked into Sunsama) but I can create, edit and view events, as well as view other team members calendars and see meeting agendas. Sunsama also gives me an agenda view and daily agenda summary email every day so I know what's on my plate for the day. Next up is the meeting tracker, Meeting Tracker is extremely useful for setting up productive meetings. Setting agenda items are easy and can be assigned time limits and assignees for each item. Really useful and keeps meetings on point and on time. Tasks for me is kind of a super basic novelty feature in Sunsama, and I don't really use it. If you are a heavy user of task management tools to keep your tasks organized, I might recommend using a separate tool for this. Or you can just reach out the Sunsama support and let them know what you'd like to see in the app. They have been extremely communicative with our team, we suggested a handful of feature requests that we would love to see, and they delivered! Rather quickly as well. Another great feature here is the Slack integration. The integration alerts me when I have an upcoming meeting or if I've received a meeting invite, a comment, or a meeting has been canceled. The interface is subtle yet very clean, which allows me to be more productive. However, I feel that at times the experience can be cumbersome when switching between views. Overall, I really enjoy being in Sunsama every day, and the team over there has created a killer tool with really great potential. Selecting and viewing teammates calendars. Setting up organized meeting agendas. Slack Integration. The app stability rarely goes down. Selecting and viewing teammates calendars. Setting up organized meeting agendas. Slack Integration. The app stability rarely goes down. Sunsama's Tasks feature; although tasks can be useful, it is somewhat arbitrary in this tool. Thank you for the detailed and honest review of Sunsama. We're still working hard on improving the functionality of tasks in Sunsama (once we have integrations with tasks tools) we think the experience will be a lot better. Overall, we're stoked to hear that you have less tabs open. I'd love to dig in on the trouble you're having switching between views and see if we can't improve those annoyances for you. 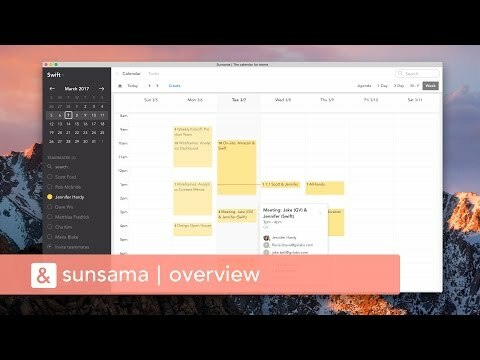 Sunsama was a great tool for me to use, when expanding to our team it wasn't quite as effective but it still is a great personal tool to track my calendar, my productivity and to plan tasks.Sunsama provides a great tool to not only see your calendar but coordinate tasks so you can plan those into your day and also track when you're getting tasks done. This works for one person or even a small team or department. Sunsama provides a great tool to not only see your calendar but coordinate tasks so you can plan those into your day and also track when you're getting tasks done. This works for one person or even a small team or department. Sunsama could improve how it manages the team tasks a little bit better. It's a good calendar with task tracking but it's not as full featured a task tracker with a calendar if you're looking for that tool, which for us meant having to duplicate tasks in multiple places. I was hoping you could share a bit more about your challenges with managing tasks for the team. This is an area we're looking to improve in and your feedback would be awesome! Helps me manage my task backlog and prioritize urgent and important tasksI really like the concept behind Sunsama, and how they've approached it in a sort of fresh way: it's very urgency and importance focused (think quadrants) and is geared around helping you see what tasks need to be done the most and when on your calendar. You can create a backlog of tasks and quickly see which tasks are most important to put on your calendar. You can also setup reminders and recurring tasks and just put on your calendar what you know you can reasonably get done. I'd say it is also one of the best apps I've seen for meetings, with baked-in features for notes, action items, scheduling, social features and more. If you find yourself in a lot of meetings and with a daunting task list of varying priorities day-to-day, I'd say this is the app for you. It was a great way to manage the chaos and focus on what has to get done, and to keep track of things when you're always on the go. I really like the concept behind Sunsama, and how they've approached it in a sort of fresh way: it's very urgency and importance focused (think quadrants) and is geared around helping you see what tasks need to be done the most and when on your calendar. You can create a backlog of tasks and quickly see which tasks are most important to put on your calendar. You can also setup reminders and recurring tasks and just put on your calendar what you know you can reasonably get done. I'd say it is also one of the best apps I've seen for meetings, with baked-in features for notes, action items, scheduling, social features and more. If you find yourself in a lot of meetings and with a daunting task list of varying priorities day-to-day, I'd say this is the app for you. It was a great way to manage the chaos and focus on what has to get done, and to keep track of things when you're always on the go. However, what Sunsama has a harder time with (in my humble opinion) is managing tasks that have large scopes, i.e. reaching project level. If you are often managing various projects with many facets, tasks, timelines and employees, I think there are probably better apps out there for you. If most of your work is focused around individual clients or tasks that fall within a more narrow scope though, I think this is probably a great choice. Below are some frequently asked questions for Sunsama. Q. What type of pricing plans does Sunsama offer? Q. Who are the typical users of Sunsama? Q. What languages does Sunsama support? Q. Does Sunsama support mobile devices? Q. Does Sunsama offer an API? No, Sunsama does not have an API available. Q. What other apps does Sunsama integrate with? Q. What level of support does Sunsama offer?